(Harke-Khidmat Kard Makhdum Shud)Hazrat Khwaja Syed Fakhruddin Gurdezi (RA) was Hussainisyed born in 544 hijri at Gurdez. Hazrat Khwaja Syed Fakhruddin Gurdezi (R.A.) and Hazrat Khwaja Moinuddin Chishty (R.A.) were first cousins and spiritual brothers. Hazrat Khwaja Syed Fakhruddin Gurdezi (R.A.) was also the Khadim-e-Khas of Hazrat Khwaja Gharib Nawaz (R.A). He used to attend on Hazrat Khwaja Gharib Nawaz (R.A.) day to day matters. Therefore, he and his descendants the present Khadim community took pride and deemed it as an honor to be called “Khadims” of Hazrat Khwaja Gharib Nawaz (R.A). They are also referred to as Mujavirs, Syedna, Sahibzadas, Khudm, Gaddinashins, etc. by the devotees and pilgrims, who pour all kinds of offerings (Nazar) upon them, in the name of Hazrat Khwaja Moinuddin Chishty(RA). Khwaja Hussain Nagori has alluded these Khadims as equivalent to Ridwan (the door keeper of heaven), and this shows how great Saints of the time held the Khadims in high esteem, and appreciated their role. When Hazrat Khwaja Moinuddin Chishty (RA) proceeded for India, his Peer-o-Murshid (spiritual mentor) Hazrat Khwaja Usman Harooni (RA) asked him to take one of his blood relative and follower, Hazrat Khwaja Syed Fakhruddin Gurdezi (R.A.) along with him. Hazrat Khwaja Syed Fakhruddin Gurdezi (RA), the Khadim-e-khas used to attend on Hazrat Khwaja Moinuddin Chishty (RA) day to day matters. ‘During my twenty years company with my ‘Shaikh’ (spiritual leader), I did not find any other person , except Fakhruddin so near to him. Hazrat Khwaja Fakhruddin stayed with the Huzoor Khwaja Gharib Nawaz (RA) up to his last breath and when Khwaja Saheb kept himself busy in prayer and meditation or in seclusion for a number of days he looked after all his affairs and management of Khanqah and Langar Khana (Kitchen for Poor). Hazrat Khwaja Syed Fakhruddin Gurdezi (RA) died in Ajmer, on 25th of Rajab 642 A.H./1245 (nearly a decade after the Wisaal (demise) of Hazrat Khwaja Gharib Nawaz (R.A.) and was buried near Mazar-e-Pak of Khwaja Saheb in the Hujra, which is now known as “Toshk Khana”. His annual Urs is celebrated on the 25th of Rajab, with all religious ceremonies, by the Khadims, (Syedzadgan). Hazrat Khwaja Syed Masood (RA), Hazrat Khwaja Syed Mahboob Bahlol (RA) and Hazrat Khwaja Syed Ibrahim(RA). The Khadim’s of Huzoor Gharib Nawaz(RA) are performing the religious duties since eight centuries, i.e-since demise of Khwaja Gharib Nawaz(R.A). Undoubtedly, the Khadims, who have been attached to the Shrine since its inception, played a key role in the smooth functioning and in keeping strict discipline in all the rituals and ceremonies. As a result, they often invited the ill-will and wrath of pilgrims and other officials. But their genuine concerns are to perform all the ritual smoothly with centuries old custom. The keys of the Holy Shrine including the Toshak Khana are in the custody of the Khadims since inception according to centuries old Baridari system of our ancestors. Only the Khadims have the privilege to open (after giving Azan at the door step of the Shrine) & close the doors of the Holy Shrine at the fixed time, for centuries in religious & hereditary capacity. They serve the Mazar-e-Pak (Holy Shrine) and pray for those People who come and also for those unable to come to the Holy shrine but are desirous of obtaining the blessings of Gharib Nawaz (RA). This is their right to serve the holy Shrine, to perform all religious rituals and arrange spiritual functions, to receive all kinds of Nazar are hereditary and its all judicially recognized. The documentary evidences are in the “Malfoozat” (Sayings) of Chishtia order and historical literature, Shahi Faramin, Sanads etc. (Imperial orders). The jagirs and honours conferred upon the Khadims from time to time not only by Muslim Rulers but also by many Hindu Rajas and Chieftains of India and even by the British Government during their succeeding regimes. Khadims are the custodians of the Shrine, the whole management & control of all the affairs inside the Shrine (Gumbad Mubarak- Aastana Auliya), belong to Khadim community. Although Khadims have faced a number of revolutions and changes of the Government policies but under all circumstances and worst political upheavals, Khadims and only Khadims are custodian of the Holy Shrine and performing all the traditional rituals, duties and welcoming the devotees. The Mazar-e-Aqdas (Holy Shrine) of Hazrat Khwaja Gharib Nawaz (RA) always remained under the custody and care of the Khadims from the very beginning. All the mundane customs & traditions of the Mazar-e-Aqdas (Holy Shrine) are performed by Khadims only, according to centuries old Chishty tenet. Only Khadims are entitled to take Pilgrims for Ziyarat at the Holy Shrine, and they have the right to receive all kinds of Nazar & Niyaz (offerings) at the Holy Shrine (Mazar-e-Aqdas) of Huzoor Khwaja Gharib Nawaz (RA). The Khadims has kept the glorious traditions of secular character and composite culture of this institution alive for the last 800 years. 1. It is rather unthinkable for a moment that the Khadim community in this long history of the institution has everacted against the interest of the institution or the country on the contrary we have always contributed for the strengthening of the institution and also contributed in construction and renovation of several parts in Dargah Sharif for the Pilgrims. The Khadim community has kept the glorious traditions of secular character & composite culture of this institution alive for the last 800 years. There are some false and created discredit for Khadim community in general out of jealousy & obvious reasons. 2. Both of these Personalities were Mureeds (Disciple) from the same Peer-o-Mursheed (spiritual mentor) Hazrat Khwaja Usman Harooni (R.A.) thus they were Peer Bahi too (spiritual brothers). Mr. S.A.I. Tirmizi former director of Archeological Survey of India has compiled the Mughal documents translated the Persian Farmans (imperial orders) into English (1526-1627) which was published by Manohar publications, Ansari Road, Darya Ganj, New Delhi in which there are several Mughal documents which establishes the fact, that Mujavirs (Khadims) of Khwaja Sb. have also received Nazars, Jagirs and Farmans (imperial orders) from Mughal emperors as offerings. However, in the closing decade of the fifteenth century Shaikh Jamali arrived at Dargah in company of his Pirzadah Shaikh Nasiruddin, (son of Shaikh Samauddin Kamboh) and observed that quite number of Hindus regularly pay homage at the Shrine of the great Chishti Saint, and as a mark of respect offers all Nazar to the Mujaviran. Shaikh Jamali was very much impressed by the Saint like qualities of 80 years old Maulana Masud, the Khadim and direct decendant of Khawaja Fakhruddin Guedezi and referred to him as Mujavir-e-Azim-ul-Qadr (greatly respected Mujavir). Jamali had also consulted the Malfuzat of the Khwaja Sahib compiled by Maulana Ahmad which was with Maulana Masud. Khwaja Khanun Gawaliari had also developed close links with the famous Syed Matha (Khadim) during his stay at Ajmer. Source: Siyar-ul-Arifin (Ms) f. 12a (printed text, Lahore 1976), p. 19. The Siyar-ul-Arifin clearly states that Masud was the descendant of Khawaja Fakhruddin Gurdezi (RA) the Khadim of Khwaja Garib Nawaz (RA). Between 1562-79, Akbar visited the Shrine almost every year, on annual Urs, on the birth of a Prince, or a success in campaign, either against Rajputs or Afghans, he was always found paying thanks giving pilgrimage at the Shrine and lavishly pouring cash and kind as Nazar on Khadims. The young Emperor firmly believed that all his successes were due to spiritual blessings of Khwaja Moinuddin Chishty (RA) whom he considered his Peer. Nearly all the contemporary well known historians of the period had praised the virtues and Saint Ship of Shaikh Daniyal, on whose forehead light of purity was always visible. Akbar converted his residence into a palace which is still in the possession of the descendants of Shaikh Daniyal, known as Mahal Valas among the Khadims. It is important to note that Akbar’s relations with the Khadims of Dargah did certainly influence his religious perception and policy. Details of the Emperor’s lengthy discussions and sittings with Khadims have been furnished by many contemporary writers, where matters about religion, philosophy, Sufism, especially of Chishty order, were the themes of talk and discussions. It is fact that the Khadims bring in the light with the Mughal Emperor, the need of the persuasion and propagation of Chishty ideals of humanism, piety, tolerance, and brotherhood, in the pluralistic society of India. For example, it appears that after each of his earlier visits to the Dargah, Akbar abolished the practice of enslavement of war prisoners (1562), remitted the pilgrimage tax (1563), and finally abolished Jaziya, after paying homage to the Shrine of Shaikh Niazamuddin Auliya (RA) at Delhi. During the stay at Ajmer once Jahangir fell seriously ill and made a vow at Dargah that after the recovery from illness, he would perforate his ears, wear ear-rings as a mark of slavery to Khwaja. On regaining health, he fulfilled his vow by perforating his ears and wore ear rings as a mark of slavery to Khwaja Baba. Many of his nobles also followed the Emperor and wore ear-rings. He also offered a golden railing around the Mazar Sharif, and issued a gold coin bearing the novel inscription of Ya-Moin on it. He also presented a Degh (cauldron) and cooked the food and distributed it with his own hands, performed the ritual of candle lighting (Roshni) and distributed cash and kind rewards to many recluses and also offered Nazar to the Khadims. It is an Arabic word meant for any kind of offering (both in cash & in kind) the pilgrims & Mureeds offer voluntarily to their respective Duwagos (Khadims of Khwaja Baba.) for the “satisfactory – spiritual services” (Dua) rendered by them. It is also paid on the fulfillment of one’s own vow (Mannat) it is a gesture of appreciation paid for rendering satisfactory spiritual services hence it is just a personal intention or wish. It is neither pre-determined nor pre-fixed but self willing on the fulfillment of one’s cherished desires. Based on age old Sufi tradition of Dargahs & Khanqas it is purely meant for Khadims use. Candid opinions in the form of questionnaire (Istifta) were invited by Fida-Ul-Mulk, Arshi Ajmeri on 11th Moharram 1378 A.H. from different Ulemas (Scholars) and Muftis (religious authorities) to give their religious verdict (Fatwas) on this subject which are as under Istifta (Questionnaire) option. Question-1. Who is entitled to receive the Nazar offered to the inhabitant of a Shrine (Sahib-e-Mazar)? Answer – 1. As per Islamic law, the Khadims of Sahib-e-Mazar are entitled to receive the Nazar. The Nazar is rather not acceptable if it is not meant for the Khadims as refered to above because the dead has no right of ownership and the only intention will be to offer to those associated with the Mazar. Question-2. Whether the Nazar for Sahib-e-Mazar and offering for Dargah carry the same idea and conception or both are different and if so what is the utility of the two? Answer – 2. Nazar for the Khadim of Shaib-e-Mazar and donations for Dargah are two different things. The former ensures the benefit of specific persons through ownership while later refuses ownership to any specific person. The benefit is accrued to the administration of the Dargah but these administrators will not own the Nazar (Dakshina) but it can seek donations (Daan). Instead they will spend it on the administration and management of Dargah. The idea behind the former is to seek spiritual benefits from the Mazar-e-Aqdas through Khadim while the purpose in the later case is to strengthen and assist the management of Dargah. Hazrat Maulana Abdul Aziz Mohaddis Dehlvi has also expressed the same opinion in Fatawa-e-Azizia. Question- 3. In general when a Nazar is committed for fulfillment of some desire, will it be deemed for the Sahib-e-Mazar or for his Dargah ? Answer -. 3. Although Nazar is restricted for Almighty Allah yet generally it is made to Auliyas (Saints) as a Wasila (source/medium) to achieve the goal because the Auliyas are close to Allah. On the contrary Dargah is nothing but a collection of bricks and stones. It derives all its sanctity only from Sahib-e-Mazar and a Nazar to Dargah carries no meaning. Question- 4. Any Dargah Committee (Govt. body) has a right to deprive the Khadim of a Shrine from the income of the Nazar for Sahib-e-Mazar and create its right thereupon? Answer – 4. It is nobody’s right to break the law of Shariat. The Islamic courts have established that the management of Dargah should respect the convictions and traditions of the past and should never forget the intention with which a Waqf is created. The Nazar to Dargah is therefore meaningless. In case of Khadims their forefather Hazrat Khwaja Fakhruddin Gurdezi (RA) served Hazrat Khwaja Moinuddin Hasan Chishty (RA) in his life time and their descendents are serving the Holy Shrine till today, it’s a matter of great honor and pride for Khadims and they can never be deprived of their hereditary rights and duties, adverse human efforts culminating into anarchy. Question – 5. If the money out of Nazar for Sahib-e-Mazar is given in the custody of the Dargah Committee (Govt. body) and the Dargah Committee (Govt. body) spent it for some other purpose instead of spending it on the Khadims of the Shrine, then would the Nazar be treated as fulfilled or not. Answer -. 5. According to Allama Abdul Ghani Nabulusi (RA) and Hazrat Shah Sahib Mohaddis Dehlvi the real intention behind offering of Nazar is its utilization by Khadims of Sahib-e-Mazar. In furtherance to this the abstract from Hadique-e-Nadiyya is also important to note that Nazar should be utilized according to the will of that who offers the same. It may therefore be concluded that Nazar should be spent essentially upon the Khadims of Sahib-e-Mazar. If spent otherwise it shall not remain a Nazar. And all knowledge is derived from Allah the great who knows and commands everything. The position of Khadim is two fold – on the one hand he is “duty bound” for the hereditary services of the Shrine and on the other hand it is purely spiritual to the entire satisfaction of the pilgrim in return for a religious act (Dua) for the fulfillment of his vows (Mannat) either before or after. Thus Ajmer is both religious and historical for people of all caste and creed. Actually there is unity in diversity and that is why they – the prince, the politicians, Actors, poor, rich anyone who comes here, they wanted to be in tune with the spirit once again. The “Sufi Saint” bestows his blessing on all regardless of rank, race and region this is the living miracle of the Saint. 3. There has been a litigation between the Dargah Committee (Central Govt. body) and Khadims for last 4 decades regarding the droppings in the historical two Degs (Pots) installed by Mughal emperors Akbar & Jahangir in the Dargah Sharif. The civil suit No. 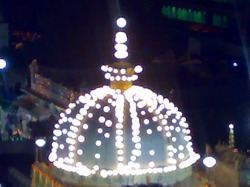 61 of 1970 was instituted in the court of learned District Judge, Ajmer against the defendants that the droppings in the two Degs mainly on the ground that after the commencement of the Dargah Khwaja Sahib Act, 1955, the two Degs installed in Dargah belongs to Dargah Committee because of the Dargah endowment. The defendants Khadims disputed the claim of the Dargah Committee on the ground that since inception, the Khadims have been receiving the droppings in two Degs, which is Nazare-Gharib Nawaz (RA) and they are not covered by the term Dargah Endowment. The learned trial court relying on the judgment of the Honorable Supreme Court 1961 Page 1402 and number of witnesses & history regarding offerings, came to the conclusion that since inception, the Khadims have been receiving the droppings in the two Degs and hence it has been judicially recognized. Thus the suit of the Dargah Committee was finally dismissed in favour of Khadims on 10th March, 2006 by the learned Additional Civil Judge, Court No. 1, Ajmer. As far the facilities of the Zaireen are concerned it is the duty of every Khadim to treat them with due honor and dignity and to provide every possible facility to them. The devotees to the Holy Shrine, factually speaking are the guests of Huzoor Khwaja Gharib Nawaz (RA) and have been treated as such all along by the Khadims. It is a fact that despite all the efforts made by the Dargah administration and the local administration, most of the pilgrims stay with their respective Duwagos (Khadims). Moreover, Khadims try to make their pilgrims stay as much comfortable as possible. And for the last 800 years, we are keeping with this tradition earnestly & religiously. All the Khadims houses are offered and used for Zaireen accommodation, (as per Khanqahi Nizam) free accommodation & food are provided to Zaireen without any charges. Whatever Zaireen offers to his Mujavir (Khadim-E-Khawaja) in form of Nazrana, it is purely voluntary.